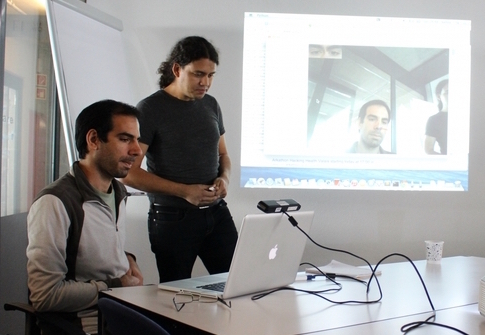 How can you use face tracking technology to improve human-machine interaction ? Eyeware has a grand vision: to give all computers, devices and robots the ability to understand people, with the help of next-generation machine vision algorithms. Thanks to its innovative eye tracking technology, complemented by head and face tracking, Eyeware opens the door to new applications in healthcare, robotics, consumer research, and social studies. By joining HH Valais’ 2015 Arkathon, PhD students Kenneth Funes and Carlos Becker were able to validate the application of Kenneth’s research on head tracking technology, a byproduct of his research on 3D gaze tracking, in a healthcare environment. 18 months later Eyeware co-founders are still going strong and focusing on releasing their first commercial venture. Eyeware has a grand vision: to give all computers, devices and robots the ability to understand people, with the help of next-generation machine vision algorithms. Thanks to its innovative eye tracking technology, complemented by head and face tracking, Eyeware opens the door to new applications in healthcare, robotics, consumer research, and social studies. Their first product, Eyeware Assist, is a PC software that enables hands-free computer control for paralyzed people. “The Arkathon was an opportunity to apply the research I was conducting into a concrete problem for patients at the Romand Rehabilitation Clinic (CRR)” explains Kenneth. At Idiap, a Swiss research institute for Human and Media Computing, he was developing cutting edge technology for which he was eager to employ in diverse applications, including healthcare. On the other hand the CRR had a number of patients without mobility in their arms which found current systems for computer control unsatisfactory, with only but a handful of companies developing solutions. Impressed by the demonstrator the team developed over the course of the Arkathon, the clinic offered them to their facilities, staff and patients to help support development post-hackathon and validate patient use. This enabled the team, now joined by Idiap senior researcher Jean-Marc Odobez and entrepreneurs Serban Mogos and Bastjan Prenaj, to test, validate and refine the product. As grand prize winner for the Arkathon, the team also integrated The Ark’s e-health acceleration program, which was instrumental in supporting their go to market strategy. “Through this acceleration program, we want the projects developed at the Arkathon to be realized quickly and take full advantage of windows of opportunity in their respective markets,” says Sébastien Mabillard. He’s the coordinator for e-health projects for The Ark Foundation, a regional incubation and acceleration service which provides support not only for technology and business development but also for marketing, legal and medical. Besides winning the $50,000 René Liechti Foundation award, and the International Create Challenge, Eyeware also gathered support from Swiss venture consortium Venture Kick, which also helped fuel the go to market work. Recently, they were amongst the finalists in the renown MassChallenge accelerator program. 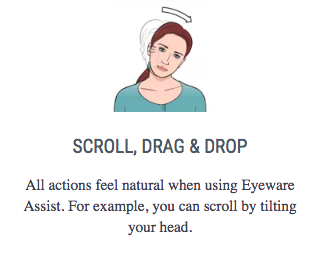 In the process of developing their first product, the Eyeware team are aiming expand their offering to social behavior research, marketing, and social robotics, amongst others, as their software can support studies on human-human interaction, help understand consumer’s interests, and be a key component in human-perception algorithms for robots. Their first product, EyeWare Assist, is about to hit the French and German markets. It provides users more than just a head and face controlled mouse, allowing them to stop, resume, scroll and even configure. By letting the device track his or her face features and movements, the patient is able to refine control and expand capabilities – even more interestingly, the software is able to learn and adapt to each user. It will become available for all platforms, and the team is working to find optimal channels for making their product easily available to their customers.